Retro-Acid is Kozzmozz' second oldest concept and celebrates the infamous Roland TB-303 bass machine. Thé party for the fans of the 303 and it’s unmistakable Acid sound, the machine that formed and shaped electronic music and keeps influencing it. It surely did so in the early days when we loved to dance to it ! And the current Acid revival proves that we still do today ! First of all Paul Mac from the UK who put out more than 120 releases on leading techno-labels as Intec, Sino, Kanzleramt, FU .. Comm and Ben Simms Ignoma label which also released his third album last year. He also runs C-Sides with 10 EP’s to date by himself and Stimulus that also gives opportunities to upcoming artists. Paul may be best known for his full blown techno sets but we can assure you that he will be playing a true old skool acid set here ! Brixton from Germany started out as a dj. before he started to produce for labels as Drop Bass Net Work and Analog Records. In 1994 he founded his own label Hollzplatten, followed by Kazumi and SimpleMuzik in 1998. Last year he delivered his first album: eTechno.de. His live performances are rare and extra-ordinary so don’t miss out on this full blown acid live-set ! They are joined by Belgian veterans in the field as Deg, still undisputed resident of Fuse after ten years and a guest at all the first raves and big clubs in Belgium. 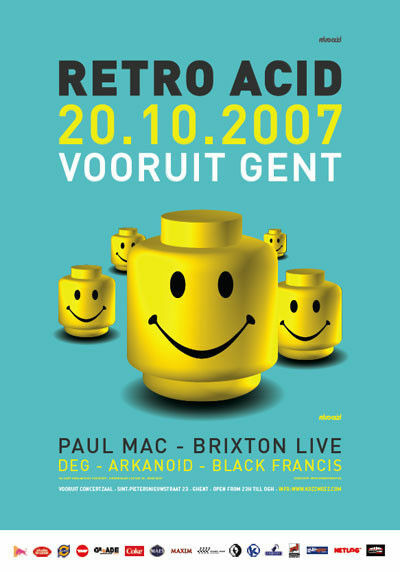 During the acid days, Deg was also part of the famous BWP Experiment, a collective from Brussels including Acid Kirk, D-Jack, Mike DMA and Seal Phüric. For Arkanoïd from Binary Bassline it will be his third appearance at Retro Acid but this time he will deliver a tweaking dj-set instead of a live. Next to releases on his own label, he can also be heard on labels as I Love Acid (UK), Acid Jack (Ger) and Zodiak Commune (NL). Black Francis recently played on I love Techno and was present on the first three editions of Retro-Acid and Kozzmozz ( about 10 to 8 years ago ..). So how more old skool can you / we get?